Like all children about to set off on an adventure, Luka Khalifa is a special kid. For one thing, his father is the famed storyteller Rashid Khalifa, "the Shah of Blah," "the Ocean of Notions." For another, Luka's older brother, Haroun, had already had an adventure of his own, travelling to a previously unknown moon and overthrowing a terrible enemy who threatened the Sea of Stories. Finally, and most importantly, Luka's mother announced on the day of his birth that her newborn son had the power to turn back time; after all, he had been born well after his parents' youth. Plus, he was left-handed. So it is only a matter of time before Luka finds himself in the midst of a great adventure. It begins, however, with something Luka gives very little thought to. 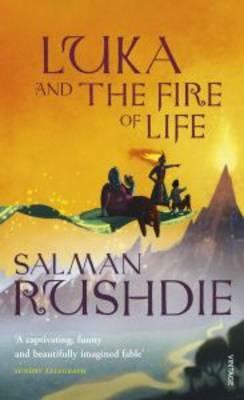 When the Great Rings of Fire circus comes to the city of Kahani, Luka stops to watch the animals and performers troop through the streets. When he sees that the gentle beasts are treated cruelly by the brutish leader of the circus, the hard-hearted Captain Aag, he does what any other kid would do: he curses the circus master. The difference between Luka and other kids, however, is that Luka's curse comes to pass. An evil fate befalls the circus, and the next morning, outside Luka's door are waiting a circus bear named Dog and a circus dog named Bear. They have come to be Luka's companions. But curses are not things to be thrown about lightly, and Luka's first experiments with magic soon come back to haunt him, as a mysterious illness takes hold of his beloved father. Just when it seems that Rashid Khalifa will fade away altogether, Luka is visited by a flock of hideous vultures bearing a message from Captain Aag, threatening vengeance for the boy's curse. The next morning, he looks out into the street and sees an apparition that looks exactly like his father. As he dashes out into the street to try to make sense of this double, he stumbles, and when he regains his balance he realizes he has somehow stepped into the World of Magic. And so begins his adventure. In the company of Bear, the dog, and Dog, the bear, and led by this troubling version of his father, whom he calls Nobodaddy, Luka must do what his mother said he was born to. To save his father, he must work his way upstream, against the current of the River of Time, and do what has never been done: he must steal the Fire of Life. The episodes of his quest are hair-raising and often hilarious. Luka and his companions must make their way past the many dangers of the River of Time as they head upstream. Some, like the Old Man of the River, are there to guard against intruders. Others, like the rats of the Respectorate of I, are merely ill-tempered. And the most perilous dangers aren't enemies at all, but the simple fact that it's difficult to go upstream, and if you do you'll have to pass the Swamp of the Mists of Time and the Whirlpool of El Tiempo, to say nothing of the Rings of Fire. But the World of Magic is not all hostile, and as he works his way towards his goal, Luka makes many friends, receives help from strangers and even falls in love. By the end of his adventure, the whole World of Magic has been stirred up like a hornets' nest by the young intruder. Still, the best adventures aren't about swashbuckling or narrow escapes; they're about learning something about the world and about yourself. As Luka is drawn deeper and deeper into this strange world populated by nearly forgotten gods and figures from exotic myth, it is not the World of Magic that comes into focus for him, but his relationship with his beloved father back home in bed, the storyteller who conjured this whole world out of nothing by the sheer force of his imagination. In the end, Luka's adventure is quite literally a race against time. But to succeed, the young boy must not only make his way to the Fire of Life - to return, he must convince the angry gods of the truths he has learned on his quest. Only when he has changed the World of Magic can he return to his own world and his father's bedside. Weaving together bits of mythology, fairy tales, children's puns, metaphysics and echoes from well-known tales as different as The Matrix and The Wizard of Oz, Luka and the Fire of Life becomes a story about things as intimate as a boy's love for his family, and as sprawling as the meaning of life itself.